When setting up a G/Technology environment, one of the boring things always is getting your ConnectionConfigurationMap.ccm right. One way to see what ddc-file is causing you trouble is use sysinternals Process Monitor tool and see what the last ddc-file read by the G3E-executable was. 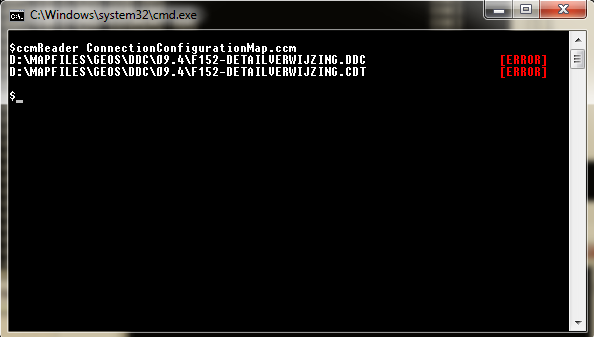 The next file immediately following that file in your ConnectionConfigurationMap.ccm then is the cause of your problem. This approach works but is very boring and can take a lot of time. 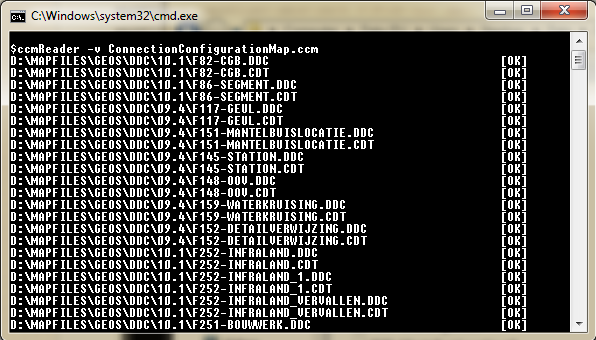 Therefore, I created a tool called ‘ccmReader’ which stands for ConnectionConfigurationMap Reader and its soal purpose is to check the validness of a ConnectionConfigurationMap.ccm file. I use this tool very often in my day-to-day work, and it comes in very handy. This entry was posted in G/Technology and tagged Configuration, DDC files, G/Technology, Tools. Bookmark the permalink. we have just installed g-tech Software in our system we have the setup path in registry for .ccm file having the following contents:. we are not able to find ddc file in the setup or at the installed path of G-tech please help me generating these files. If you can give sample .ddc file that will be much help to us.